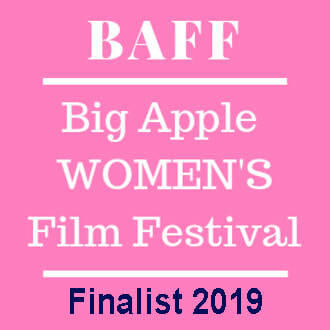 Finalist Big Apple FiLM FEST! An ex-marine, widower has a new neighbor move in which he strongly disapproves of. The young, female moving in next door tries hard to know her new neighbor, NORMAN (60's), but can't break through his walls. In a case of mistaken identity, the two finally come together and form an unexpected bond. An experimental animated film based on a true story. A Grand Daughter and Grandmother clash, but as KAY matures and learns more about her Gramma MILLIE, she begins to understand her Gramma by learning about her past. Purple Gang - A young man takes back his town from a brutal, Jewish street gang during the prohibition era. Big Sister - After the horrific murder of mother, father and aunt, 21 year old Cecily exacts revenge on their murderer igniting a feud between two families. A Message From Beyond - A high school senior releases a vengeful spirit through the eye of her cell phone. Tapped - A comedian tries to make a comeback and is confronted by his past. BIG SISTER is now an official selection for one of the top 50 festivals located in Oaxaca Mexico! We are very excited to attend this Fall, and hopefully make the connections necessary to produce our first feature film in 2018. ​A woman exacts revenge on her parents murderers while caring for her brother. Cecily (20's) is awoken by her parents late one night. Frank (40's), is on the phone with her Aunt Janice (30's), who is being attacked by her abusive boyfriend Vic (40's). Cecily's Mother Marion (late 30's) asks Cecily to watch her brother Norman (11) while they go help her sister. When Marion and Frank arrive at the run down home, the door is open and they walk in to find Vic abusing Janice. Frank pulls a gun, but Vic is too quick and kills all three, leaving Cecily and Norman as orphans. This devastates the two, when Officer Michaels (30) and Officer Andrews (50's) deliver the news. Frustrated with the police, Cecily takes matters into her own hands and kills Vic. Officer Michaels has fallen for Cecily and protects her from Officer Andrews who suspects her as a vigilante. Alicia (50), Vic's sister and Joe (18) his nephew, are informed of Vic’s death at their trailer park. Joe, a known troublemaker, decides to start harassing Cecily. Joe doesn't buy her story either. Cecily's neighbors Joan (40's) and her daughter Jen (16), along with Cecily's friend Bart (20’s), support her and Norman through their ordeal. When things begin to escalate between Vic’s family and Cecily, Officer Michaels continues to protect and pursue her. Norman ​gets caught in the middle. Joe and his minions chase him through the woods and Norman ends up in a coma, Joe and his buddies Frank (17) and Nick (18), have taken this family feud too far. Officer Andrews does not let go of his theory about Cecily, and when all three teens go missing, his suspicion grows. But, Officer Michaels has fallen hard for Cecily and keeps his partner at bay. Bart and Michaels realize Cecily has snapped and finds the teens caged up in an abandoned basement, with her as their captor. Michaels is forced to shoot her before things go to far. In the end, Andrews theory is squashed by Michaels. The unfatal wounding Michaels inflicted on Cecily actually saves her life and she and Norman are reunited. This movie was both an engaging read and a compelling story, with drama and action on every page! The plot has nice momentum and is pulled forward by a driven and thought-provoking main character. The tension that is built is real, palpable and dynamic. There are many rich textures to this film, including a sizzling taboo romance, Western-style Vigilante Justice and a crime-drama turned Pyscho-Thriller twist. Attention must be paid to the length of the film, which is a concise 82 pages and a good length for a compact tale.